...on the placement of windows. Or actually it isn't such a new view, as the windows I am about to show you are from the 19th and 17th century. 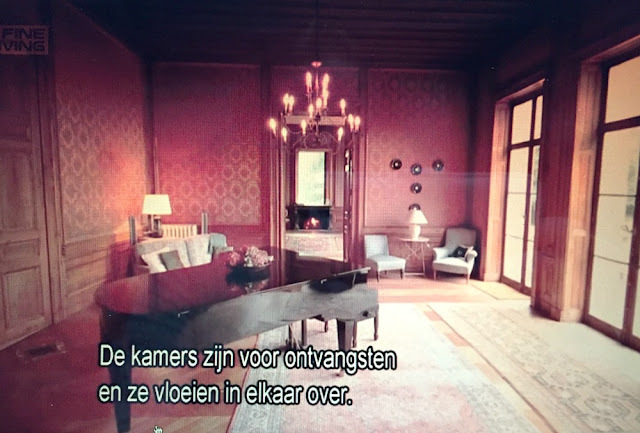 When I was drawing up the design for my Herengracht Canal House, I had to scrap several ideas because the placement of elements like windows, doors, fireplaces etc. were conflicting with one another. 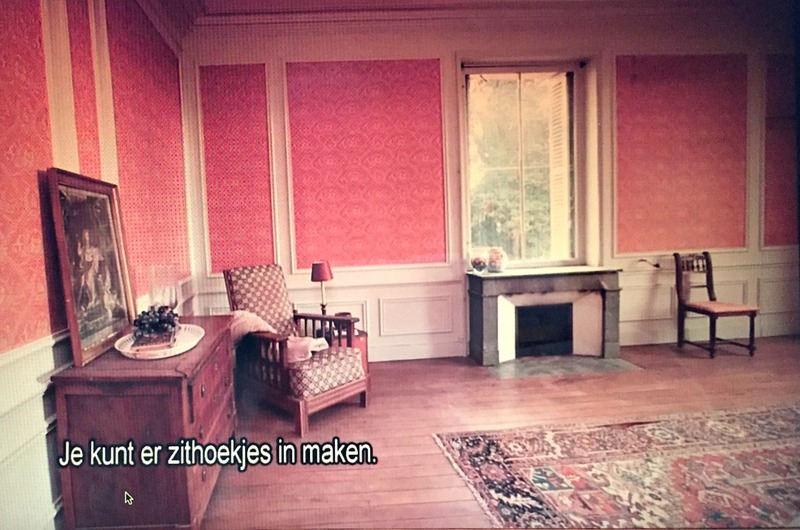 Especially if there are only three walls in a dolls house the design can be a difficult puzzle to solve. But should it really be such a puzzle? Please read on! 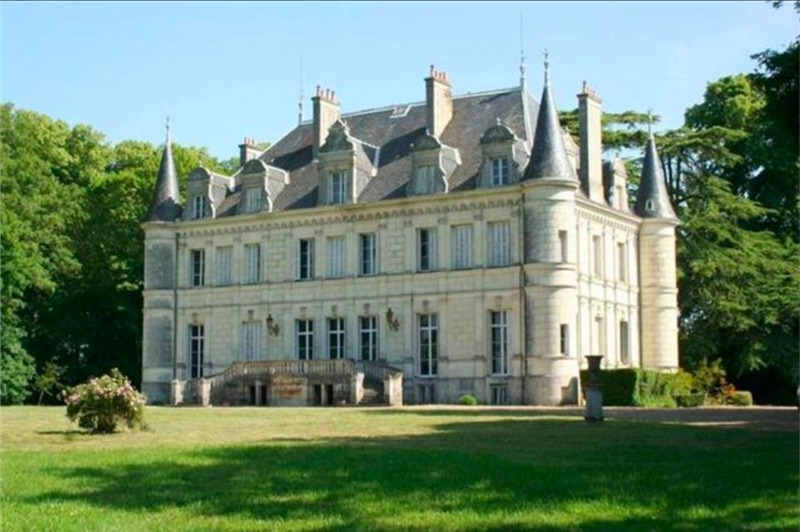 The rather lovely French Chateau which was for sale. One of the rooms with doors opening onto the garden. The room is connected to the next room with a single door. The open door allows a view of a nice fire burning in the fireplace on the end wall. The window above the fireplace lets in lots of light and offers a nice view of the garden. The fireplace has..., wait, what? A window above the fireplace? Oh yes dear readers, that is exactly what it is. 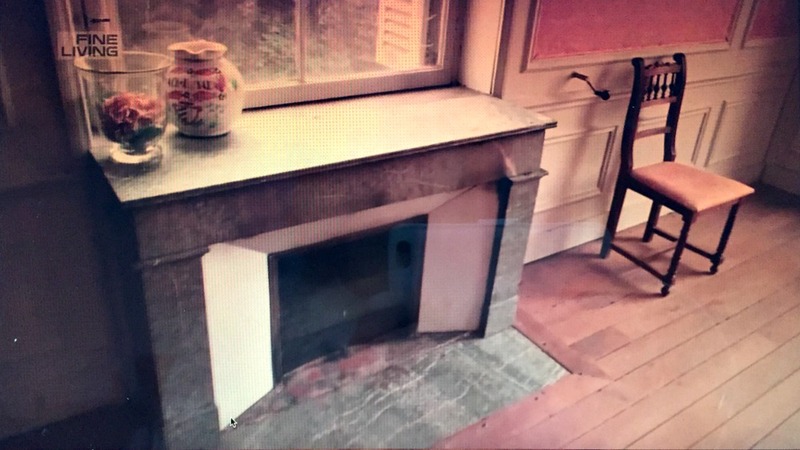 A working fireplace with a window above it. No sign of a chimney breast anywhere. I have never seen this before. A small window in or right next to the chimney breast, yes. But never a huge window where the chimney breast should be. The other rather wonderful thing about this window above the fireplace is that it has a hidden mirror in the wall. The mirror can be pulled out in front of the window, serving as a sort of shutter, keeping out drafts or light. It looks like all the rooms on the end walls have a fireplace with a window above it. Here is one of the bedrooms with the same arrangement. I don't know how the smoke from the fireplace is extracted. The walls don't seem thicker than normal and the windows are as wide as the fireplace, leaving no room for extraction going straight up. The smoke must go into the walls via the side of the fireplace somehow. See the handle on the wall to the right of the fireplace? That could be to open or close the flue. Or to close shutters. Or to open a secret door leading into the tower. Who knows. The next window I want to show you can be found in one of the canal houses in Amsterdam which houses the Biblical Museum. The 17th century canal house has a wonderful (winding) staircase which passes in front of a window. No attempt has been made to adapt the window to the staircase or vice versa. Halfway up the stairs there is another unusual element, a doorway leading to side rooms. 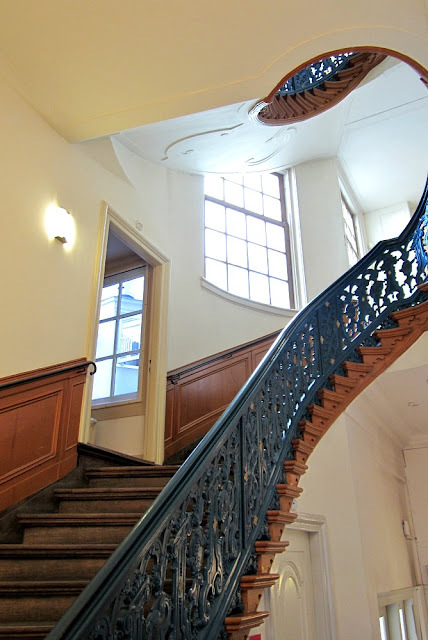 The windows of the staircase and the side rooms look out onto a small inner courtyard. 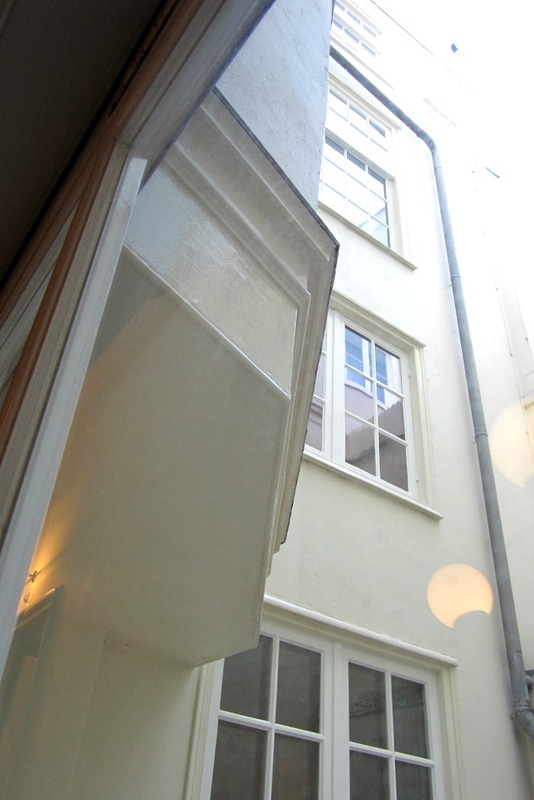 The courtyard serves as a lightwell in the center of the deep canal house. Is the house not wide enough to house a grand staircase? Then just add a bit onto the building. Simple as that. And below again, part of the staircase is going in front of the window and taking off the corner of the door frame and door. The moral of this story? As a dolls house builder I can have a lot of freedom in my designs and still keep some sense of realism and historical connection. The reality is that probably everything has been done before, so I can't really go wrong, can I? And if I do, so what? I can do with the house what I like, that's the fun of it all. 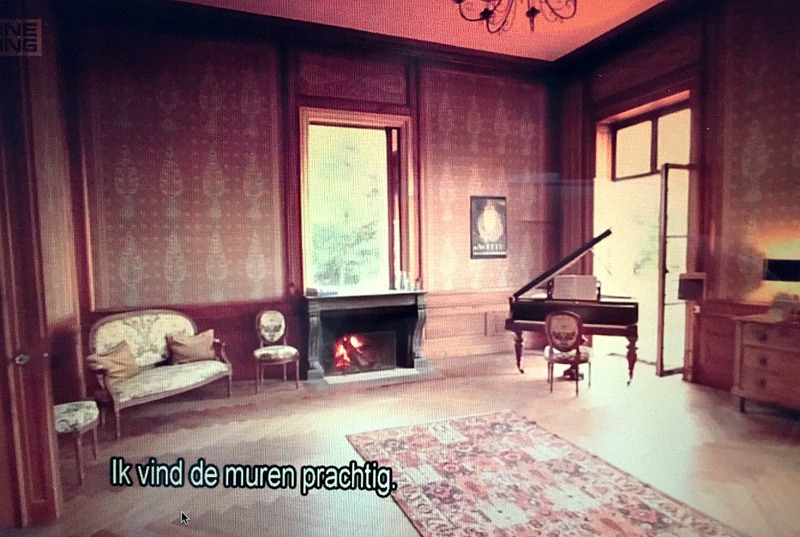 The first photo shows the side on the right with the chimney for the fireplaces in the photos above. 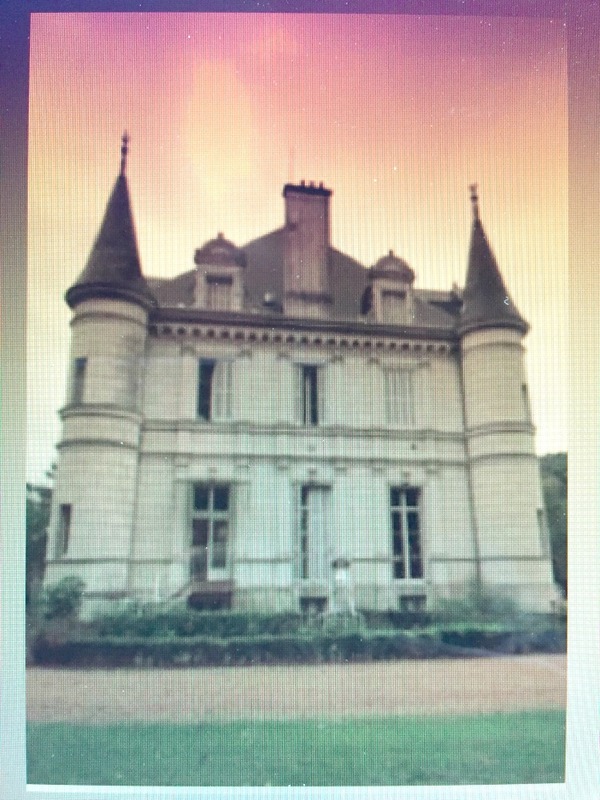 The second photo is of the left side, which shows this side probably only has fireplaces on the upper level, as the ground floor has windows/doors opening to the garden. Hi Josje! What a Fascinating example of unexpected design those fireplace windows are!!! I have seen modern versions.... but never in an older building!Wow! What an eye opener! As for the spiral stairs with doors off the side, I have seen that in a house in Salem over here... an eighteenth century "mansion" with very elegant woodwork, and the servants doors off the stairs at an awkward angle with no care for their safe stepping! I guess the very idea of "building codes" was yet to be born! LOL! I think your sense of "freedom" of how to shape your dollhouses is a Wonderful thing! We all strive for "realism"... but as you say, probably everything has been tried sometime or other! That castle is fascinating.... I think my favorite idea is the mirror as hidden shutter..... ! I look forward to seeing how this will manifest in your wonderful buildings! Thank you for sharing this discovery! Hi Betsy, the mirror/shutter is great isn't it? I already have an idea where I could use those. Not sure if I'll have enough wall space for it though. But we'll see. Oh, and I notice that on the picture of the end wall of the Chateau exterior, you can see the chimney emerge from the roof directly above the open window...! I would not have noticed that odd placement without seeing your interior pictures. What a startling concept! That's why I added the photo of the castle in the beginning, but I forgot to mention the chimneys. Thank you for reminding me! Fantastic ideas! Years ago I started building a house where I made some 'architectural blunders'. Eventually I abandoned the project. I think I need to take it out and revisit those awkward corners. You are so clever to have spotted all these things! Exactly. We are held back by conventions. Freedom! LOL! Wat een geweldige vondst, Josje, nu kan eenieder, die problemen heeft met het realiseren van haar/zijn wensen in een poppenhuis, vrijelijk haar/zijn gang gaan, TOP :D! 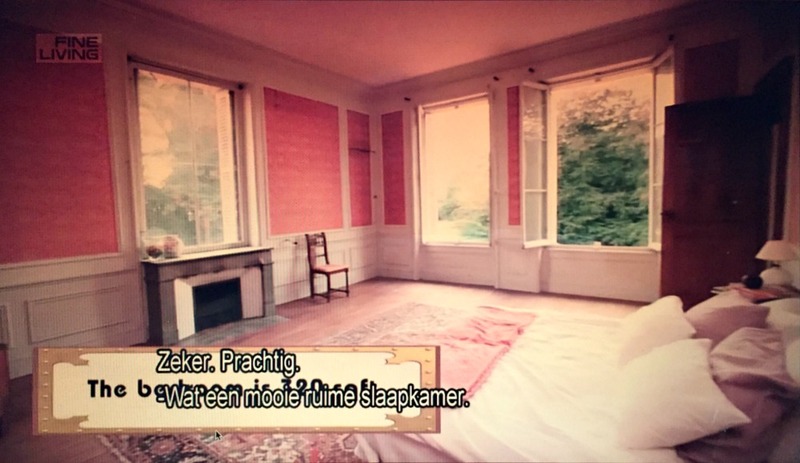 Dankjewel voor het delen hiervan! 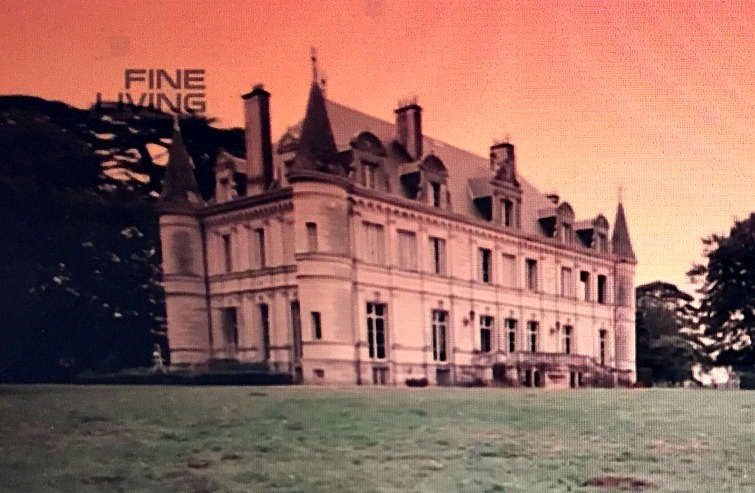 C'est très étrange cette fenêtre au-dessus de la cheminée, je n'ai jamais vu cela, merci de nous faire partager cette fantaisie architecturale. Can you imagine coming from that doorway and navigating those stairs with long skirts?? And no electrical light... There must have been quite a few people falling down those stairs. I love your ideas! That's right that we ourselves choose the rules. Building the dollhouse can't be a stress, but joy and creativity together! Thank you for sharing thesse great photos that give ideas. I had never seen a window above a fireplace before, that's very interesting. How very interesting! I also have never seen a window directly over a working fireplace. ;-) I wouldn't be able to rest until I found out where all the smoke goes. It is a bit disturbing. Having installed a window at stair level in my villa stairwell, I was already aware of such unusual examples of awkward architecture, however thanks to your post, I am even more encouraged to not let "Conventions" Rule and to take more chances with certain mini projects. I once began a google search for windows in chimney stacks, and I found one- the chimney was wide and the window was encased in the middle with 2 brick smoke stacks running up either side of it. Solomon the Wise wrote that there was nothing new under the sun, and that everything done, has been done before. And it appears that he was right! In architecture there often is a battle between aesthetics and practicality, sometimes leading to some odd building choices. But I agree, let's not be held back by conventions! Freedom and originality! Fascinating! I completely agree that everything has been done before! Sometimes you just need to see some examples to help push you along. I think there were a lot of innovations that would help in our mini creations if we can just find them! Very interesting, thanks for sharing, curious to see how you are going to use that idea if/when you do. If the walls are quite thick there should be plave for the flues there. I once borrowed a book on house building from my brother and I was fascinated by the way the chimney flues sometimes split at angles to serve two rooms! You can hide a lot in thick walls, the Cape Dutch houses had very thick walls with fireplaces build into the wall. I am really glad you took me on a tour in the canal house and pointed all those quirks out to me. Thank you for posting those amazing pictures. What a beautiful house and such a grand staircase. The window above the fireplace is lovely. It makes me think of the fireplace in castle Howard. Above the fireplace is open space with sculptures; the smoke goes up a chimney to the side of the fireplace. It is a great effect. Creo que es importante utilizar siempre la imaginación.Es una manera de progreso. No había visto nunca esos ¿errores? arquitectónicos. Me parecen geniales. I've never seen a window above a fireplace either and I love that staircase. I wonder how it would work out in mini? 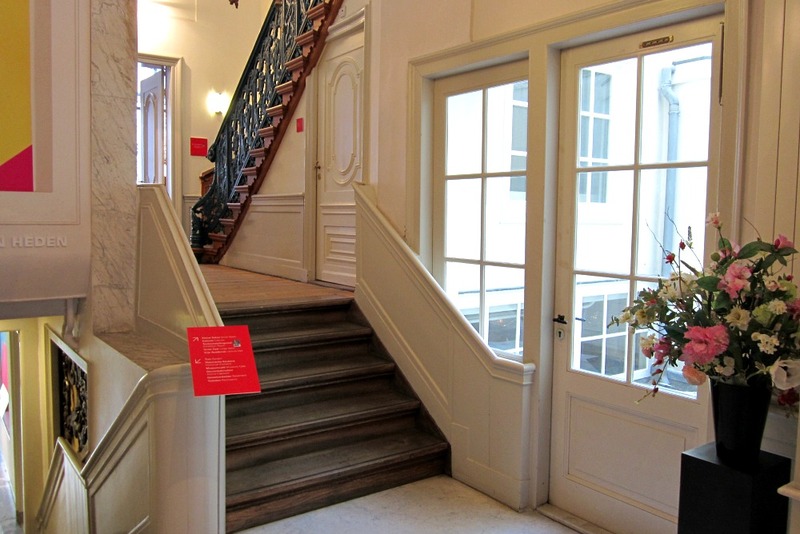 Oh Josje, you should have written this post sooner than I would have included a round staircase and window in my plan. But honestly, great examples! Very interesting, thank you. The same goes for my house Huibrecht. 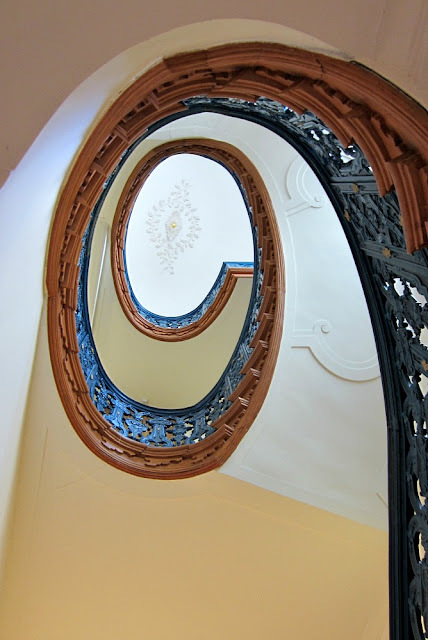 Well not a round staircase, but my house would have looked different, surely!